GETAC, maker of rugged notebook, tablet, and handheld computers, are releasing two new models equipped with fingerprint scanner access control and a smart card reader for worry-free secure transactions. SAN DIEGO–GETAC Inc., a pioneering manufacturer of rugged computers that meet the demands of field-based applications, will showcase three major new systems – its fully rugged M230 laptop, and newly introduced lightweight rugged P470 laptop and fully rugged V100 convertible tablet PCs – during the 27th Annual ESRI International User Conference, being held through June 22 at the San Diego Convention Center (Booth #2123). The Geographic Information Systems (GIS) conference is expected to draw some 13,000-plus users. GETAC offers a complete line of rugged notebook, tablet PC and handheld mobile computers expressly designed and custom manufactured for people whose jobs demand lightweight, high-performance hardware systems that are proven in tests to survive even the most extreme weather conditions and work environments. GETAC systems are qualitatively superior because they are built rugged from the inside out – part of a commitment to meet and then exceed virtually every industry standard for durability and in-the-field performance. GETAC’s semi-rugged, rugged and fully rugged computing solutions are durable enough to withstand the most challenging environments facing the physically toughest jobs that people in military, industrial, law enforcement, public safety, utility, telecommunications and field sales and service jobs perform. These jobs routinely place computer systems into situations where dirt, dust, water, motion, vibration, temperature and other factors would severely damage or disable commercial-grade devices. GETAC M230. The GETAC M230 rugged notebook computer combines high performance and a full menu of state-of-the-art built-ins and options in a rugged, ultra-portable slim design that meets MIL-STD 810F and IP54 standards for durability under extreme conditions. The M230 includes several features not available anywhere else that will appeal to ESRI users – a larger 14-inch XGA or 15-inch SXGA TFT LCD high resolution display, an optional ATI M54 chip for additional graphics processing power, more storage (up to 120GB) and the ability to accommodate a wide range of plug-ins. Inside, it offers an Intel® Core™ Duo L2400 1.66 GHz processor, 2MB L2 cache, and 512MG DDR2 (expandable to 4GB). Outside, options include a sunlight readable display, touch screen, waterproof membrane keyboard, TPM 1.2 and Kensington lock security features, smart card reader and other upgrades. 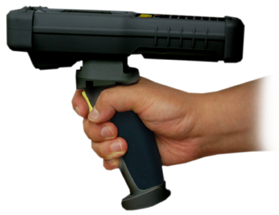 The M230 accommodates a variety of wireless options and an optional GPS receiver. The unit will also be on display in the Public Safety Solutions and Mobile Solutions areas at the event. GETAC V100. This recently introduced rugged convertible PC features an LCD screen that instantly transforms from a notebook into a tablet PC and is fully compliant with MIL-STD 810F and IP54 standards. The highly portable 4.9-pound V100 features ultra-quiet fanless design and includes a wide range of standard features, including a 10.4- inch screen, power-saving 1.2 GHz Intel® Core™ Duo Platform Technology, 512 MB expandable to 2 GB of DRAM, 120 GB shock-mounted removable hard drive, Integrated Bluetooth, reversible waterproof camera, and a full menu of wireless networking capabilities – all housed in a water resistant rugged magnesium alloy case. The package includes the Microsoft® Windows® XP Professional and XP Tablet PC Edition 2005 operating system. To satisfy customers’ unique GIS applications, the V100 offers a variety of advanced options, including a 12-inch LCD screen with daylight readability and choice of digitizer or touch screen interface as well as optional Integrated GPS, 3G and 802.11a/b/g functionality that keeps users connected whether they are in the office, in a vehicle or outdoors. GETAC, a subsidiary of MiTAC Technology Corporation, was founded in 1988 as a joint venture with GE Aerospace and has been a pioneer and innovator in the rugged mobile computing industry ever since. GETAC provides premier fully rugged and rugged notebook, tablet PC and handheld solutions for the military, law enforcement, public safety, utility, telecommunication, manufacturing, field service and mobile workforce industries. Its rugged computers are strictly controlled and monitored from the design, manufacture, quality assurance to service flows, making GETAC an industry known rugged computer provider. For more information, visit the GETAC Inc. website at www.getac.com.